A guide to one of the most prominent figures of 20th century American popular music. John Herndon Mercer (1909-1976), a native of Savannah, Georgia, began writing songs at the age of fifteen and eventually became one of the foremost figures of 20th century American popular music. His catalog includes many numbers that have become American classics, and his activities as lyricist, composer, performer and businessman span a period of nearly five decades. Mercer was born on November 18, 1909 to real estate investor George A. Mercer, Jr. and his wife Lillian (Ciucevich). He spent his childhood and youth in Savannah, growing up in a household where music was much in evidence (despite the fact that no one in the family was especially "musical") and in a region where the local culture combined the rich literary and language traditions of both white and black Southerners. In later years, fans and observers noted the traces of this Southern heritage still evident in his writing. In 1922 he continued the family educational tradition by joining his brothers at Woodberry Forest School in Virginia. Mercer received his last formal education during his five years at Woodberry; he did not continue on to college after leaving the school in 1927. After leaving school Mercer worked in his father's business before traveling to New York as an actor with a Little Theatre group that had entered a competition for one-act plays. He received favorable notices for his performances, determined to return to New York to pursue an acting career, and returned the following year to spend 1929 and 1930 trying to establish himself as an actor. He continued writing songs during this time (he had written his first song at age 15 while a student at Woodberry Forest). When told that casting for the Garrick Gaieties of 1930 was complete but that the show still needed songs, he supplied "Out of Breath And Scared To Death of You." The song was included in the show, marking the start of his career as a professional songwriter. From this beginning Mercer went on to become one of America's major songwriters of the 1930s to the 1960s, often writing tunes as well as lyrics, despite his lack of formal musical training. 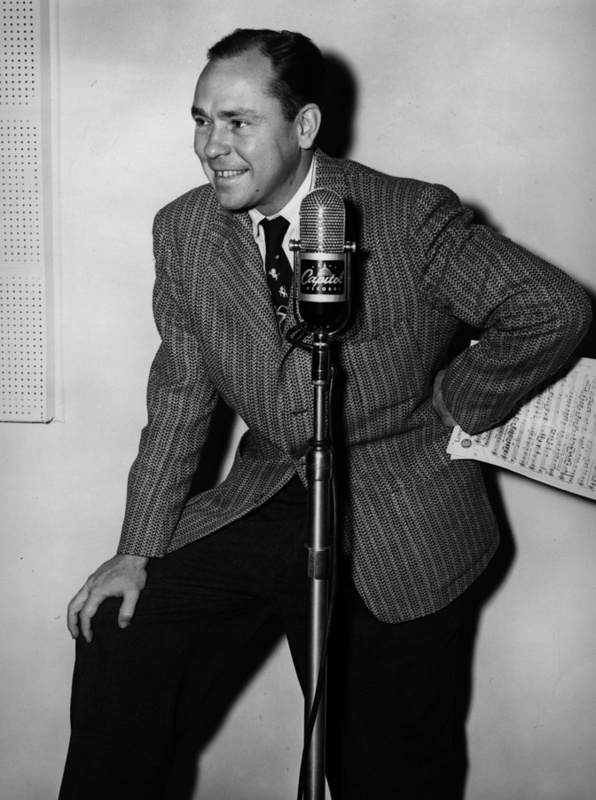 He worked primarily in New York through the early 30s, writing for such shows as Pajama Lady and Americana, producing the hit "Lazybones" with songwriter Hoagy Carmichael in 1933, and collaborating with various other writers including Harold Arlen, "Yip" Harburg, Bernard Hanighen and Matty Malneck. A 1935 offer from RKO for Mercer to write and act in two films prompted him to move to the west coast. There his talents proved to be perfectly suited for work with the flood of Hollywood musicals produced during the following decade. Mercer's work in Hollywood resulted in a remarkable record of hit songs. During the decade between 1936 and 1946 his catalog grew to include "I'm An Old Cowhand From The Rio Grande," "Too Marvelous For Words," "Hooray for Hollywood," "You Must Have Been a Beautiful Baby," "Jeepers, Creepers," "Day In-Day Out," "Blues In The Night," Skylark," "That Old Black Magic," "Tangerine," "Accentuate The Positive," "Dream," "On the Atchison, Topeka And The Santa Fe" (Academy Award winner, 1946), "Laura," and "Come Rain Or Come Shine," written with a series of collaborators that included Richard Whiting, Bernard Hanighen, Harry Warren, Rube Bloom, Harold Arlen, Hoagy Carmichael, Victor Schertzinger and David Raksin. Although his Hollywood acting career never developed beyond the initial contract with RKO, Mercer was active as a performer from the 1930s on, singing first with Paul Whiteman's band, where he was paired vocally with Jack Teagarden and served as master of ceremonies, songwriter and arranger. He began recording with Bing Crosby in the 1940s and was active during World War II as a favorite Armed Forces entertainer, performing on G. I. radio shows and producing such topical numbers as "G. I. Jive" and "Duration Blues." In 1942 Mercer expanded his career as songwriter and performer to include the role of businessman when he and colleagues Glenn Wallichs (owner of a Hollywood music store) and Buddy De Sylva (then of Paramount Pictures) founded Capitol Records, Inc. Mercer served as Capitol's first president, and despite shellac shortages, union disputes and the fact that the most popular artists were already signed to other labels, the young company prospered. By the mid-40s Capitol was giving the Decca, Columbia and RCA Victor labels serious competition by producing one-sixth of all the records sold in the United States. Under Mercer's guidance Capitol signed and developed lesser-known artists and new stars, such as Nat "King" Cole, Stan Kenton, Jo Stafford, Paul Weston, Peggy Lee and Margaret Whiting. 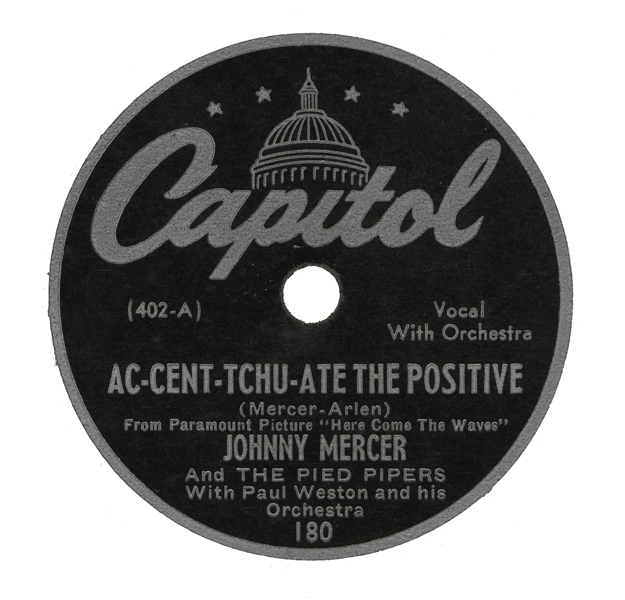 Mercer himself made a number of popular recordings on the Capitol label, most notably with Paul Weston and the Pied Pipers. Although the decline in production of movie musicals around 1950 left Mercer with few opportunities for work on full-length scores, he remained active nonetheless. He continued ongoing collaborations with such artists as Robert Emmett Dolan, Harold Arlen, Rube Bloom and Hoagy Carmichael and began new associations with others such as Gene de Paul and Henry Mancini. His film scores during this period included Daddy Long Legs (1955), and stage productions included Top Banana (1951) and Li'l Abner (1956). Mercer attained distinction as a songwriter by receiving Oscars for three more of his songs between 1951 and 1962, namely "In The Cool, Cool, Cool Of The Evening" (1951), "Moon River" (1961) and "Days of Wine and Roses" (1962). Other songs from the period include "Glow-Worm," "Something's Gotta Give" and "Satin Doll." As the musical trends of the late 1950s continued into the 1960s and early 1970s, the demand for extensive film scores of popular songs gradually dwindled. Although Mercer continued to collaborate with various songwriters, and received an Academy Award nomination as late as 1971 for the song "Life Is What You Make It," there were undeniably fewer opportunities for the type of writing for which he had been noted in the past. Nevertheless he continued to write virtually until his death, not only with many of his early collaborators but also with some of his younger colleagues ("Life Is What You Make It" was written with composer Marvin Hamlisch, and another relatively "late" song, "Two Of A Kind," was written with Bobby Darin in 1960). Mercer's last major collaborative venture was a musical called The Good Companions, written in 1974 in collaboration with composer André Previn. In the end his catalog included over 1,400 songs, created over a period of 45 years, written by himself and in partnership with a remarkable number of America's most prominent popular composers. Mercer underwent surgery for a brain tumor in October of 1975, and never recovered from the operation. He died on June 25, 1976 and was survived by his wife Elizabeth "Ginger" (Meehan) Mercer, to whom he was married in 1931, and their two children, Georgia Amanda (known as "Mandy") and John Jefferson (known as "Jeff").